Electronic Arts (EA) yesterday revealed its latest title: a custom game environment for deep learning networks to learn how to play video games. In the future the “computer” player in games won’t rely on basic scripts; it’ll react to you, and play against you, using the same information and controls a human player does. If you’re a gamer, you’ve probably played one of EA’s games. The list of hits in the company’s catalog contains some of the greatest selling franchises of all time. Many of us have grown up with games like Battlefield, Madden, and FIFA, each titles with robust computer (CPU) opponents built-in. And, over time, those CPU players have evolved. They’ve been programmed to call in for help or take cover, often even serving as a “squad mate” that replaces human team members. But they’ve still mainly relied on pre-programmed scripts and random number generators. Once you’ve figured out the “AI” tendencies, you’re likely to find success against it. That means beating a computer player doesn’t compare to the bliss of crushing an actual person. A CPU opponent that ‘thinks,’ however, could change that. Researchers from EA’s Search for Extraordinary Experiences Division (SEED) set out to expand on previous work using games to train neural networks. In order to test their novel training system they built a custom 3D environment for a machine to navigate. The problem EA is working on, mastering imperfect information games, can’t be solved in the same way that, for example, DeepMind approaches training AI to master Chess or Go. Playing a game like Titanfall 2 taps into a skill set that’s closer to playing poker than a board game where all players are given the same information. Earlier efforts by teams working on the same problem were hindered by simplicity, but EA’s approach draws inspiration from humans. If you’ve ever played a multiplayer first-person shooter like Battlefield 1, you know there’s no end to human ingenuity when it comes to exploiting gaming environments and controls. Reinforcement learning agents are generally limited to carrying out one action at a time, due to the nature of the neural network architecture and the way they are trained. As such, agents often encounter situations where they are forced to choose one out of many actions, when in reality the optimum solution is to perform multiple actions at once; such as moving forward whilst turning. 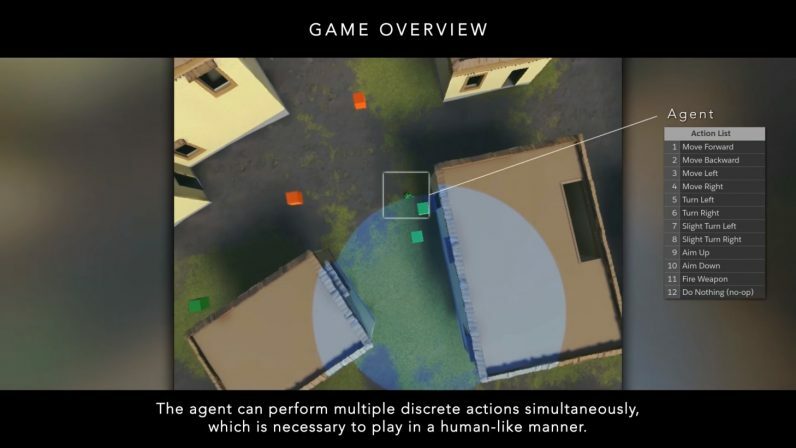 Indeed, certain behaviors will never emerge when an agent is limited to performing only one action at a time … these techniques can be used to teach an agent to play a challenging fully 3D first person shooter (FPS) style video game, an important milestone on the way to training neural networks to play modern AAA FPS games. And indeed, the project’s white paper indicates that EA’s novel method is superior to previous efforts. It “provides a 4x improvement in training speed by having the agent learn useful behaviors by imitating the play style of an expert human player” by beginning with a 50/50 blend of imitation learning and reinforcement training. Over time the AI’s experience is guided more by reinforcement learning as the amount of imitation learning is gradually decreased. EA’s goal to train neural networks on AAA titles doesn’t seem very far off. And using AI to test the limits of a gaming environment could help eliminate (or at least lessen) launch-day bugs: anything that can be used as a tool to create better games is good for gamers. In the meantime, whenever EA’s AI is ready for a real challenge: TNW has gamers on staff.